Small kitchen is not uncommon in our time. If you have a small kitchen, do not worry. There are at least 6 ways to make it quite comfortable and convenient. As a result, you will be pleased to be in it and prepare your favorite dishes. As a rule, in the kitchen we are engaged not only in cooking and washing dishes. We usually eat there, and chat with friends, and, in general, spend our free time. That is, in fact, this is the place where we spend most of the time. That is why it is so important that your small kitchen be beautiful and functional. Organization and order are the main principles by which everything should be arranged. Then literally every corner of the kitchen will be useful. Light colors not only make the room brighter. They also “make” it more spacious. Of course, this happens only in our perception. Dark colors, on the other hand, have the opposite effect – they “make” a room smaller and more cluttered. It’s not about everything being white. The color of the walls, furniture, kitchen devices can be different, but always in a light “tonality”. Well, when some of the details of these devices and furniture differ in color. Of course, the tile should also be fairly light. 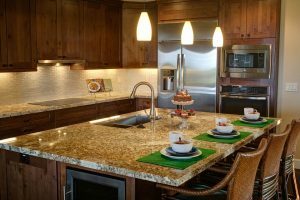 When space is limited, and there are many different things to do, as is usually the case in the kitchen, maintaining order and rational arrangement of furniture become especially important. It is necessary to think over every detail. Doors and drawers of kitchen furniture should be comfortable to open, everything you need should be easy to “reach.” Every thing, every object must be in its place. All this will save you a lot of time. Plates, glasses and kitchen utensils are best kept in tall lockers. One of the walls is well left free from furniture. This will visually increase the space. Furniture boxes are better divided into several “compartments”. Furniture “to the ceiling” will give you more storage space for everything you need. On the shelves connecting different pieces of furniture, it is good to keep spices and different kitchen utensils. The “island” (a stand-alone furniture module into which both storage systems and household appliances can be integrated) can be installed in a small kitchen. It can be fixed in one place or on wheels. Due to the fact that the island can perform different functions, it allows you to optimize the space. These modules come in different models, different purposes and from different materials. You can choose the “island” that best suits your needs. It can be fixed in one place. Usually it is the center of the kitchen. The island can be on wheels, and then you can move it where you want. The top of the module can be used as a table for food. You can put on it a modern version of the microwave. The bottom part can be used as a locker. In it, you can keep everything you want. More precisely, what should be at hand. Make the most of all the space adjacent to the walls. Literally from floor to ceiling. Hang cabinets on the walls, attach shelves and shelves to them. This will give you a lot of extra space. Widely use shelves and racks. For example, it is convenient to hold kitchen electric devices on them. So they will always be at your fingertips. Boxes and baskets will help you keep the chopping table in order. Try to always keep it clean and tidy. And finally, you can even use the ceiling! You can attach chains to it, on which shelves will hang. On them you can keep pots, ladles, skimmers and anything you want. If you have a small kitchen, try to have kitchen appliances and appliances made of stainless steel. After all, they in a certain sense act as a mirror, and mirrors, as is well known, visually expand the space. It is quite possible to buy a refrigerator made of this material, a washing machine and smaller electrical appliances and devices. Do not block the access of natural light to the small kitchen. Therefore, we must not allow part of the window to block the furniture, it is not necessary to hang heavy, thick curtains on it. They should be light, translucent and light. Best white or beige. Must be well illuminated “work area”, the place where you cook. Lamps should focus light on the dining table. It is important that the inside of the drawer cabinets is well lit (especially if they are deep enough and painted dark).